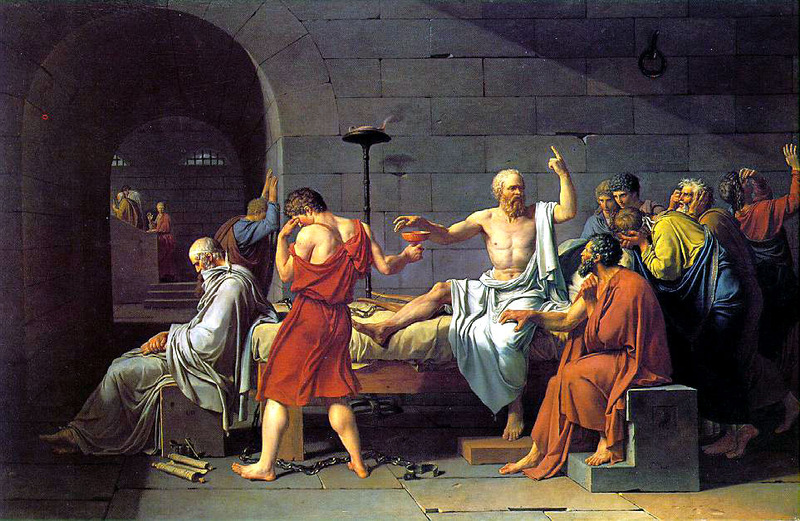 Relay trains its teachers in the questioning of Socrates, meaning the questioning he experienced before he was forced to drink poison. Carol Burris and Diane Ravitch have been offering insights into a video posted by the Relay Graduate School of Education entitled “Rigorous Classroom Discussion”. Relay is a newly accredited teacher training program that measures their prospective teachers by their students’ test scores. They must teach in one of Relay’s associated charter schools for a set time. If, by the end of that time, their students’ scores are not up to snuff, no accreditation for the teacher. This is exactly the type of teacher training that the National Counsel for Teacher Quality has been calling for. As Diane Ravitch points out, prospects do not take classes in cognitive theory or the history of education. It is skill and drill from start to finish. Not to mention, it seems like an ingenious way for the associated charter schools to get some cheap labor for a school year. At the end of the video the host, who describes herself as the head of middle school programs, says “that’s great teaching”. And as Burris and Ravitch have pointed out, no, it is not great teaching. Superficially, the classroom is the education reformer’s dream: a young white female teacher stalking a classroom of minority students in uniforms. She gives orders in cold, halting tones: “hands down, start position, you are back reading, right now.” She cuts off the student Omari while he is in the middle of giving an answer. Before that, she “phones a friend” by calling on a girl who gives a really nice answer. And what is the teacher’s response to this answer? Nothing. She gives no acknowledgement or praise, nor does she let it be known that she is building upon it in any way. She just coldly barks another question to the next student. Reformers and people in the general public often say they want teachers who are motivated and love what they do. However, this teacher conveys no love or passion for the students or subject. At times, she seems downright hostile, standing there with her hands on her hips, repeating herself over and over again. Ask yourself, is this how you want your own children to be educated? Is this a healthy classroom environment? If you answer yes, you are not being genuine. This is the reformer’s dream of how minority students should be educated. This is an environment not meant to stimulate young minds, but to stifle their spirits. I really took a disliking to this video because my teaching method can be described as the “sage on the stage” approach, which is also “teacher-centered”. My students sit in rows while I walk around the room and ask questions. These are where the similarities between my classroom and this classroom end. All I can say is that if this becomes the template for what great teaching is in the future, then the teaching profession is in a whole heap of trouble. This entire discussion is in pursuit of a correct answer. The teacher is after a character trait in the story, as well as a definition of this trait. This is low-level, mind-crushing teaching. First of all, Omari starts off by saying “ambition” is a trait contained in the story. What does the teacher do? She harps on this student and puts him on the spot so that she can get him to define what ambition is. She asked a one-word question: what character trait do you see? She got a one-word answer: ambition. Now, one-word responses are not always bad. I usually get those as a way to move to a bigger question. That is not what was happening here. This one word, ambition, was the entire show. In my mind, the sage on the stage would follow up with the question “how was this character ambitious?” It would not be an Omari question. It would be a question open to everyone in the class. That is because I reserve my one-word questions for the students who do not usually feel comfortable participating. I usually get a totally different group of hands in the air when I ask one of these questions compared to a higher-level question. To harp on that one kid after the fact totally goes against the dynamic and what my students would feel comfortable with. I would praise Omari and move on. Asking these “how” questions, as most teachers know, requires students to do much more talking. If Omari did not know what ambition meant, it would be clarified by a classmate on the next question. Also, asking a general follow-up question ensures that the other students will be paying attention to Omari’s answer. If they know I am going to harp on Omari, they have no reason to pay attention. They can sit there and wiggle their fingers and pretend they are sending “energy” to him. That is not learning. I do not even know what that is. This discussion on ambition should have been (and it might have been in this video) part of a larger lesson. Maybe the lesson calls for an overall analysis of one of the characters. In that case, the word ambition is a small thing. It is part of a larger vision and should not require so much wasted effort and pressure. This brings me to the next concern: where are the students recording all of these answers? Why is the teacher not writing on the board? If they are highlighting the traits of a character, why not list the traits and examples somewhere? That way, Omari feels vindicated when he sees his answer go on the board, as do all the other students who participate. The entire class sees that there is a bigger, overarching idea at stake in this lesson, not a bunch of choppy, isolated factoids. Quite simply, nowhere in this lesson were the contributions of the students validated, praised or justified. There is no give-and-take between student and teacher, or student and student. There is no reason for a student in this class to care or pay attention other than the fear of embarrassment. There is nothing organic in this lesson. Everything is forced: from the tone of the teacher, to the answers of the students to the wiggling of the fingers. Instead of finding what is right and good about Omari’s answer, she harps on what she thinks it lacks. Instead of praising and then using the answers of the other students, she ignores them and rolls on with the lesson. A great teacher finds a way to use every response from students, no matter how off the wall or off base it seems. A great teacher can take the tiniest grain of truth, thought or insight contained in a student’s response and use it to build the next question. A great teacher can do this by instinct and the students will learn that, every time they raise their hands, they will contribute something and not be put on the spot. Most importantly, students learn that the “truth” or “knowledge” is a process, not a correct answer to a fill-in-the-blank question. This is not humanistic education. This is inhuman education. It is a scary glimpse into how reformers, charter school operators and the general public see teaching. Of course, no thinking person would want themselves or their children to be taught in this way. No, this is education for “those” people’s children. The ones that need a warden and not a teacher. Maybe I am being too harsh here. As Carol Burris says, this teacher was merely showcasing the method they wanted her to showcase. At the same time, many teachers will probably be trained in this program. To think that a generation of people, most likely from affluent suburbs, are going to be trained to teach bright inner city students in this way makes me want to weep. This is authoritarian, thoughtless, soulless education. This is how you train people to follow orders and fill in blanks. One thing is for certain: this is not the “lighting of a fire” that Carol Burris describes as true learning. This entry was posted in An Embattled Career, education reform, School, teaching and tagged Authoritarian Classroom, Carol Burris, Diane Ravitch, education, Education Reform, Relay Graduate School of Education, School, Teaching, Teaching as Art. Bookmark the permalink. How they can call this a discussion is beyond me. It’s one teacher putting one student on the spot! What is it with these charter schools and total control? Charter schools are many things. They are vehicles for privatizing one of the last and most iconic public goods in the nation, vehicles for union busting, for entrenching the fetish for numbers, test scores and the vendor hanky-pinky that accompanies it – after all, isn’t that what the Common Core is really about? – and real estate plays. But charter schools are also about separating the worthy (charter school students and their families) from the unworthy poor, and training – not educating – them for their respective roles in the transient, authoritarian, under paid, over worked and over managed workplace of the 21st century. The emotional and social abuse that is called teaching in these schools is the real curriculum, readying all for the abuse they will suffer and exact on each other in the Social Darwinist, free market utopia envisioned by charter school backers.